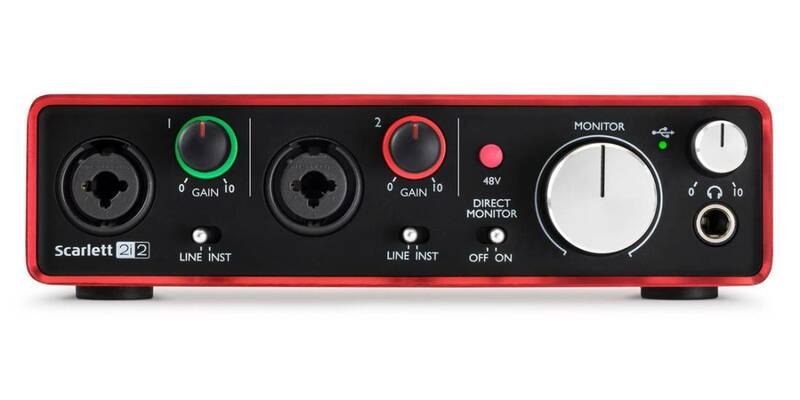 Scarlett is the best selling USB audio interface range in the world, and for good reason. It focuses on just three things; achieving the best sound, the fastest speed and the easiest experience. It is compact yet versatile, with Scarlett mic preamps, super-low latency*, and class-leading sound quality and digital conversion. The 2i2 is a compact yet versatile 2-in, 2-out USB audio interface. It gives singer songwriters two natural-sounding Scarlett mic preamps and the same class-leading sound quality and digital conversion as the rest of the latest Scarlett range. Take it anywhere, connect by USB, plug your mics and guitars straight in, and simply start recording. Focusrite interfaces are the perfect partner for Pro Tools, so Scarlett 2i2 comes with Pro Tools | First recording software in the box, as well as Ableton Live Lite and a suite of software and samples so you can start recording straight away. As youd expect, it works flawlessly with all major DAWs on Mac and PC. Don't let latency hold you back. Enhance your recordings in ways that are simply impossible with any other interface in this class, like enabling real-time guitar amp simulation and vocal reverb (depending on your software, settings and computer). Compose, record, edit, save and export your music straight away, with time-unlimited versions of industry-standard music software: Ableton Live Lite and Pro Tools | First - Focusrite Creative Pack, which features 12 additional plug-ins including the Eleven Lite for real life guitar amp emulations and Black Op for iconic distortions and overdrives. You also get Softube's Time and Tone bundle, the Focusrite Red Plug-In Suite, Novation's Bass Station virtual synthesiser and 2GB of Loopmasters samples. Perfect interface for starting out, never had an issue. Great for people who are just starting out their home studios or record on the go. Easiest & quickest setup I've ever been through with an audio interface. I did a quick vocal test with my mic and was blown away by the quality of the pres compared to my much older interface. Loving it so far. I definitely recommend.